The Town Council meeting held on Wednesday, April 11 was a short session with a juggled agenda. Franklin's State House legislators, Representative Jeff Roy, Senator Karen Spilka and Senator Richard Ross were listed as providing their update to the Council. Rep Roy was present with Senator Ross in transit and due by 7:30ish with Senator Spilka under the weather and not able to participate this night. The Council Chair juggled the agenda order to cover the other items on the agenda to allow for Ross to arrive. The remainder of the agenda was dispatched quickly. One gift to the Cultural Council was accepted. The first reading to raise the trash fees from the current rate of $204 to $208 was discussed and moved to a second reading. The increase of $4 effective July 1, 2018 still leaves the rate under the peak of $244 that was effective in 2009 and 2010. The new single stream system has been working well. The trash receptacles, "totters", are all paid for. Some repairs are made to them as needed. The amount of trash collected has fallen while the amount of recycling has increased. In the Administrator's update, it was revealed that use of the budget stabilization fund was planned to balance the FY 2019 budget. The budget hearings are scheduled for April 17, 18 and 24 with the Finance Committee. The Town Council is scheduled for May 17 and 18 for their budget hearings. Based upon recent experience with the budget hearing process. Residents are better off getting real and valid information from the Finance Committee meetings. The Town Council has done only a cursory reading of the budget with selective holds and minimal discussion. With the use of the stabilization funds this year, combined with the use of the revolving funds to balance the school side of the budget, the can has been kicked down the road (so to speak) to address the real funding issues for Franklin. If there will be need for an override, the current informational aspects of the Council meetings will need to change. The Council will need to spend more time sharing valid and appropriate information and less time trying to get the meeting over if they are going to be successful in addressing Franklin's financial needs. Unable to delay any longer, Rep Roy began his update without Senator Ross. 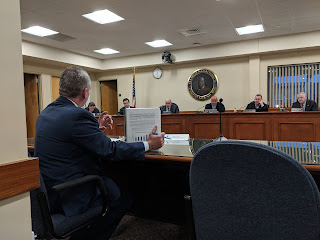 He provided highlights on the collaboration and cooperation among the legislative team and with Franklin's administration, Town Council and School Committee. As Roy was finishing, Senator Ross arrived. While catching his breath, Ross checked to see how much Roy had covered and as they revealed a couple of items not covered, those updates were provided. These last updates were interspersed with teasing from the Council Chair and others before finishing with a motion to adjourn.